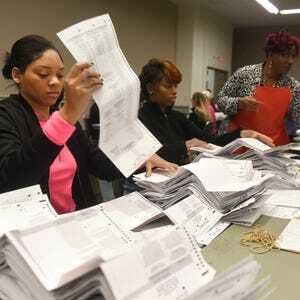 Detroit — A federal judge issued an order Wednesday that effectively suspended a recount of the Nov. 8 presidential election that started three days ago and has yet to reveal fraud or significantly alter the results. The manual statewide recount cost as much as $3 million but stopped after U.S. District Judge Mark Goldsmith lifted a temporary restraining order preventing state officials from stopping a recount prompted by Green Party presidential candidate Jill Stein. A state election board meeting scheduled for Thursday meeting was canceled. Stein failed to show she was an aggrieved candidate as defined by state law and entitled to a recount, the judge said. He concluded Stein’s request to test the election system’s vulnerability to fraud lacked evidence. “The vulnerability of our system of voting poses the threat of a potentially devastating attack on the integrity of our election system,” Goldsmith wrote. The recount triggered legal battles in state and federal courts and contrasting orders about whether Stein was qualified to request a recount considering she had no chance of winning the presidential election. President-elect Donald Trump defeated Democrat Hillary Clinton by 10,704 votes, 47.5 percent to 47.3 percent, while Stein finished fourth with 51,463 votes or 1.1 percent. Instead, Stein framed the recount as a quest to test the integrity of Michigan’s voting system and determine whether voters were disenfranchised due to possibly hacked voting machines or fraud. Stein’s attorneys have already appealed to the Michigan Supreme Court to get a state Court of Appeals ruling overturned. That ruling instructs the Board of State of Canvassers to officially end the recount on Thursday. If the board follows the court’s order, as they are expected to do, Stein could still pursue an appeal before the state’s highest court. Stein lawyer Mark Brewer declined to discuss their next steps late Wednesday. “We’re looking at (the ruling) and I'll be consulting with my client about next steps,” he said. But Stein attorneys Hayley Horowitz and Jessica Clarke said in a statement they were “deeply disappointed” by the judge’s ruling but said, “We are not backing down from this fight.” Instead, they chastised Trump for fighting the recount. Michigan Republican Party Chairwoman Ronna Romney McDaniel welcomed the federal judge’s ruling. Schuette echoed the sentiment in a statement. "In a huge victory for Michigan taxpayers and the rule of law, this recount is stopped. Our state of Michigan judicial system and the State Board of Canvassers protected Michigan taxpayers from a frivolous recount that would have cost millions of more tax dollars a day," he said. Goldsmith did an about-face from his original Monday order to jump start the recount after the 6th Circuit U.S. Court of Appeals late Tuesday suggested that he should reconsider his order if state courts ruled against Stein. “If, subsequently, the Michigan courts determine that plaintiffs’ recount is improper under Michigan state law for any reason, we expect the district court to entertain any properly filed motions to dissolve or modify its order in this case,” according to the 2-1 6th Circuit Court opinion. There is no case law recognizing an independent federal right to a recount when there is no evidence someone was deprived of their constitutional rights, the judge wrote in an eight-page order. The recount resulted in minor changes in vote totals for the candidates -- Clinton picked up a net gain of 65 votes on Trump in Ingham County, as Stein lost two votes -- while exposing issues with precincts that couldn’t be recounted because of improperly secured ballot boxes or vote counts in the boxes that didn’t match election records. The recount, opposed by Schuette and the state Republican Party, started Monday and was originally scheduled to continue in more than 30 counties Thursday until the federal judge’s Wednesday ruling. Michigan’s Board of State Canvassers anticipated the order and directed elections officials to halt the presidential recount Thursday morning if the judge issued a ruling. The panel of two Republicans and two Democrats voted 3-1 on the motion. The Board of State Canvassers has a 9:30 a.m. meeting Thursday when they could end the recount. The judge’s order came one day after a three-judge panel of the Michigan Court of Appeals ordered the Board of State Canvassers to reconsider and reject Stein’s recount petition on grounds that it was unlawful. Republican canvasser Colleen Pero proposed the conditional suspension of the recount. The board’s action came after the four members recessed twice and camped out at the state Capitol all day awaiting Goldsmith's decision. Goldsmith issued his order hours after hearing debate about whether to continue the recount. Near the end of the 90-minute hearing, a lawyer for state Attorney General Bill Schuette addressed the gravity of the judge’s pending order. “You would be the first federal court in history to order a recount for a candidate who lost by more than 2 million votes,” lawyer John Bursch said. The state GOP and lawyers for the Board of State Canvassers argued for the recount to stop, saying three days of manual counting found a change in only 66 votes between Trump and Clinton. They reiterated earlier arguments that Stein does not have a right to pursue a recount because she lost badly. Stein also lacked evidence any fraud was involved or that voting machines fell victim to cyberattacks. Stein has a “zero, and I do mean zero, likelihood of succeeding on the merits,” Bursch said. Bursch earlier said Stein should post at least a $5 million bond if the judge is going to continue the recount. That money would help cover the recount’s cost, the lawyer said. Stein lawyer Hayley Horowitz, however, said the $5 million estimate is inaccurate and pushed for a more precise figure. The Stein campaign has paid about $1 million so far for a recount costing as much as $1 million a day. Horowitz said federal law must protect the right to a recount even without evidence that election results were plagued by fraud or error.